Roman Polanski's gentle horror comedy was considered a foolish misfire in America, after being a great success in Europe under its original intended title Dance of the Vampires. The reason was simple. MGM used its final cut authority to do a lot of chopping and soundtrack-tampering, adding a fairly lame cartoon prologue and probably cutting eleven or twelve minutes out of the picture. Only around 1979 or so did the studio begin to distribute Polanski's original European cut to revival theaters, but it remained an unheralded restoration. People who saw the picture new didn't know about the chopped-up version, and most of the people who saw it before didn't go to the trouble of seeing it again. Savant wrote a fairly popular article about the restoration, which occurred before the advent of Home Video, in one of his early DVD Savant articles. It's at This link in the Savant Articles index, and it has a complete rundown on what was changed, with images from the butchered American version that, thankfully, is no longer circulated. That this favorite fantastic movie is on DVD is good news, but if you happen to have the old MGM laserdisc version, don't get rid of it! It has unique extras not carried over to this DVD release. More on that below. Professor and Vampire Hunter Abronsius (Jack MacGowran) and his faithful servant Alfred (Roman Polanski) stop off at the inn of Shagal (Alfie Bass) while en route to destroy the notorious Count Von Krolock (Ferdy Mayne). But Krolock strikes first, kidnapping Shagal's beautiful daughter Sarah (Sharon Tate). Abronsius and Alfred journey to the Count's forbidding castle to flush him out, and become tangled in confusion and bumbling. Meanwhile, Krolock, his effiminate son Herbert (Iain Quarrier) and their vampiric retinue are preparing for an elaborate ball to celebrate the survival of their flock and their luscious new victims: Sarah and Shagal's maid, Magda (Fiona Lewis). And don't forget our two vampire hunters; as Von Krolock shouts between his fangs to his 'beloved brethren': "Two more humans are in our hands!" The Fearless Vampire Killers is always a pleasant film. Until gothic horror went big-budget in the 1990s, there was nothing even remotely like it. The lavish production has location photography in the Alps, a wonderful castle fit for an epic, and costumes and other physical trappings beyond reproach. As I've said before, it's like a fairy tale, only minus happy endings and plus lots of snow. Roman Polanski touches base affectionately with the entire history of vampire horror, before the idea of homage had sunk its teeth into the filmmaker lexicon. His two vampire hunters dress like characters in Dreyer's Vampyr and Murnau's Nosferatu. The crimson vampire king Count Von Krolock is a cross between Boris Karloff and Christopher Lee, with just enough aristocratic hauteur of his own to stand apart from them. Even though some of his actions are played for laughs, Ferdy Mayne's Krolock is one of the best vampires ever. There is something new to find with each viewing. This time I finally saw dance choreographer Tutte Lemkow off to the side with his dancing stick. The fast-motion keystone kops comedy is used a lot more than I remembered, and the skis that seem to run away from the evil castle evoke silent-movie fantasy magic. Almost as a replay of his short Polish films Mammals and The Fat and the Lean, Polanski sets up Krolock's contempt for the lower classes as equally menacing as the fact that he is a vampire. For the local rabble, Polanski uses an unsentimentalized Tevye- like Jewish inkeeper to represent everything pitiful and hopeless about being an ignorant peasant. Nothing anti-Semitic happening here; Alfie Bass's Shagal is simply not as lovable as the milkman in Fiddler on the Roof. 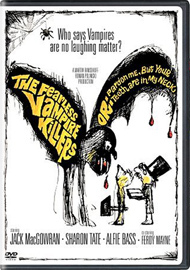 The Fearless Vampire Killers wasn't meant to be a laugh riot. It instead walks a fine line between uneasy horror and slapstick. There are lots of moments where we don't know exactly to react, at least not at first. The little green goblin that stares at us in place of the MGM Lion seems to be telling us to watch out for surprises. Herbert, Von Krolock's gay vampire son, is funny until his predatory instincts show, along with his fangs. Five or six broad slapstick moments later, Herbert has wrestled poor Alfred down to the floor while really odd-sounding lighthearted music is playing. We're not sure how to react. The movie is fall-down beautiful. It looks like a fairy tale, except with real snow that can freeze people to a real death. The lovely greeting-card forests are filled with wolves. The vampires live frozen in their crypts, and the warm-blooded human characters are at a real disadvantage. Snow beautifies frightening scenes, like the shower of snowflakes over Sarah's empty bathtub with its telltale bloodstain. Alfred tries to escape through one of those tiny castle windows, and the camera trucks in to frame a perfectly beautiful snow vista -- beautiful, but forbidding. The minuet ball is one of the best-filmed scenes of its kind, and concludes in an almost perfect mirror-illusion trick. That tour-de-force wouldn't be impressive at all in a new movie, which would most certainly use CG imagery. The Fearless Vampire Killers is a Kafka nightmare as well. Abronsius and Alfred mean well but they're entirely ineffective against the horde of organized living dead. Von Krolock and his clan have black magic on their side. By contrast the forces of good have no solidarity whatsoever, and are hampered by ignorance, indecision and faint hearts. As foolishly as Abronsius behaves, he knows the truth about the vampires and is usually correct in his judgment. He even 'predicts' the concept of bat sonar. But Abronsius is also an absent-minded elitist, overly impressed by Von Krolock's library. He peers through a telescope at cold, dead planets when he should be killing vampires. Young Alfred can't seem to make any progress either. He's easily distracted, terrified and too romantically addled to be of much use. Every step forward toward their mission is two steps backward. Warners' DVD of The Fearless Vampire Killers is a great disc to have and a tiny disappointment. The transfer is very good and the color and detail are of course an improvement over the old laserdisc but there's something slightly hazy about the image. The stunning Metrocolor hues are a bit weak and the blacks aren't dark enough. The soundtrack is fine, however, with Christopher Komeda's amazing score (one of the two or three best for any horror movie, ever) coming through with ear-pleasing clarity. For an extra there's something we've never seen before and didn't know existed: A 1967 one-reel comedy short subject. Max Wall (one of the inventors in Chitty Chitty Bang Bang) is an Abronsius-type silly professor who talks to us about vampires in his office, an elaborate set. He has a nicely made-up vampire in a coffin (attention Don Glut) that comes to life at the end. 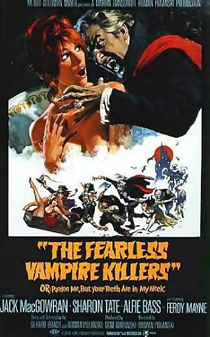 Besides starting up an ancient movie projector to show us the trailer for The Fearless Vampire Killers (included as a separate extra with its full soundtrack), the professor goes through the various anti-vampire devices and lore, as if the 1967 audience wasn't already hip to the subject via Universal reruns and popular Hammer films. He holds up a crucifix and tells us that it's no good against a Jewish vampire, and then holds up a Star of David and tells us that if we tried to use it on a Muslim vampire, it would just make him angry! The short subject looks great (it has the rich blacks the main feature needs) must have cost a pretty penny, and I doubt it saw much use. What the DVD lacks are the extras found on the old MGM laserdisc, which should now be even more collectable than it used to be. The old Eye on Sharon Tate short subject doesn't count, as that technically goes with the David Niven film Eye of the Devil which will probably show up in the future. But the laser also had the MGM-futzed alternate opening sequence with the silly cartoon prologue, and the MGM Lion that, instead of turning into a ghoul, sprouted fangs. I almost think that ditching that material was someone's idea of an aesthetic choice at Warners, for the disc and menus use the minimalist "B" advertising poster art with the chicken-scratch drawings that looks like an art movie sell. Nowhere is there a representation of the great Frank Frazetta poster art that we remember from the theaters. As a must-buy disc, The Fearless Vampire Killers is a no-brainer (see, I can write like other web reviewers if I'm tired enough). And DVD fans that can adjust their sets slightly to offset the minor grievance about the transfer will easily be able to overcome the image problems that bothered me. This is one of the best Halloween movies ever!